Hemodialysis cleans and filters your blood using a dialysis machine to temporarily rid your body of wastes and extra water. Hemodialysis can help control your blood pressure and help keep a proper balance of important chemicals such as potassium, calcium, and sodium. Dialysis replaces part of the function of your kidneys. Diet, medications, and fluid limits are needed as well. Prior to beginning hemodialysis treatments, you will work with your health care team at Pure Life Renal to learn how the treatments work and how to get the most from them. One of the most important steps before starting regular hemodialysis sessions is preparing a vascular access, also call the patient’s lifeline. This is the site on your body where blood is removed and returned during dialysis. Early preparation of the vascular access will allow for easier and better removal of wastes, as well as replacement of your blood with fewer complications. The ideal vascular access type is a fistula. The fistula is considered to be the best vascular access for hemodialysis because it provides adequate blood flow, lasts a long time, and tends to hold fewer complications than other types of access. A fistula requires advanced planning because it takes approximately 12 weeks to develop, but development may take longer. A properly formed fistula is less likely than other kinds of vascular access to form clots or become infected, and it tends to last many years, which is longer than any other kind of vascular access. A fistula is created when a surgeon connects an artery directly to a vein, frequently in the forearm. Connecting the artery to the vein causes more blood to flow into the vein. As a result, the vein grows larger and stronger, making repeated needle insertions for hemodialysis treatments easier. For the surgery, you will be given a local anesthetic. In most cases, the procedure can be performed on an outpatient basis. Check the pulse or “thrill” (vibration) in your access every day. 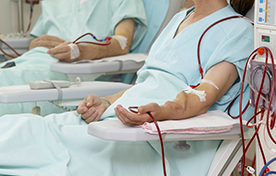 What can you expect during hemodialysis? When you arrive for your dialysis treatment, your weight, blood pressure, pulse, and temperature will be checked. You will also wash the skin that covers your fistula with soap and water. Every hemodialysis session using a fistula requires needle insertion. Most dialysis centers use two needles—one to carry blood to the dialyzer or artificial kidney, and one to return the cleansed blood to your body. Once the needles are placed in your fistula, each needle is attached to flexible, plastic tubing that connects to the dialyzer. Blood is carried to the dialyzer in the arterial line where it passes through the artificial kidney being cleansed and returns to your body through the venous line. This is completed many times over, allowing for the removal of wastes and extra fluid from your body. Because blood pressure and heart rate can change as extra fluid is removed during the treatment, your blood pressure and heart rate will be checked several times during the treatment. When your hemodialysis treatment is completed, the needles are removed from your fistula, and pressure is applied to the site to stop any bleeding. A small dressing or bandage will be put over your puncture sites. Your blood pressure, temperature, pulse, and weight will be recorded again before you leave. You can receive your dialysis treatments in the comfort of our state-of-the-art facility that is very similar to your home environment. Personal TVs, comfortable recliners, iPads, and reading materials are available for your use. Our professional staff, comprised of registered nurses and certified clinical hemodialysis technicians, provide safe and compassionate care that is individualized to your specific needs. In this method, you learn how to complete your own hemodialysis treatments, which will take place in the comfort of your home and on your schedule. You can dialyze more often at home—often 5–7 times a week—meaning wastes and fluids don’t build up as much in the body. Often, you are able to decrease your dietary restrictions and maintain your blood pressure with less medication. If home hemodialysis is selected, you will learn how to do the treatment at the clinic, working with a dialysis nurse. Most people have helpers who learn with them at the clinic; the helper is often a family member, close friend, or neighbor. The clinic will provide a machine for use in your home. Supplies, such as dialysis solution, will be delivered to your home once or twice a month. Even after training is complete and you are dialyzing at home, someone from the clinic is always available to answer phone calls, 24 hours a day. You will be required to visit the dialysis clinic monthly so the dialysis nurse can check your access site, draw laboratory tests, and complete an overall physical evaluation. If your physician has ordered medications, they may be administered during this visit, or you may receive medications to take home for self-administration. Peritoneal Dialysis is another procedure that removes wastes, chemicals, and extra water from your body. This type of dialysis uses the lining of your abdomen (the peritoneum) to filter blood. Before your first treatment, a surgeon places a catheter into your abdomen. The catheter will need to heal for about 3 weeks before it is used for your treatment, so proper planning of when to place your dialysis access can improve treatment success. Continuous Ambulatory Peritoneal Dialysis (CAPD) – CAPD requires no machine and can be done in any clean, well-lit place. The dialysis solution passes from a plastic bag through the catheter and into your abdomen, where it stays for several hours. The time period that the solution is in your abdomen is called the dwell time. Next, you drain the dialysis solution from your abdomen into an empty bag for disposal. You then refill your abdomen with fresh dialysis solution so the cleaning process can begin again. Most people change the dialysis solution at least four times a day and sleep with solution in their abdomens at night. Continuous Cycler Peritoneal Dialysis (CCPD) – CCPD, also referred to as Automated Peritoneal Dialysis (APD), uses a machine called a cycler to fill and empty your abdomen three to five times during the night while you sleep. In the morning, you begin one exchange with a dwell that lasts the entire day. Combination of CAPD and CCPD – If you are a heavy-set person, or if your peritoneum filters waste slowly, you may need a combination of CAPD and CCPD to get the right dose of dialysis. For example, some people use a cycler at night but also perform one exchange during the day. Others do four exchanges during the day and use a cycler to perform one or more exchanges during the night. Your physician and healthcare team at Pure Life Renal will work with you to determine the best schedule.